• (1) General-Purpose, for steels of hardness up to Rockwell C-45 . • (2) For Cast iron, brass and other Non-Ferros Metals. • (3) For Stainless steels and steels of Rockwell C-45 to C-59. • (4) For steels of Rockwell C-60 and higher. Note: 774-0013, 774-0021 and 774-0034 have a limited quantity and will be discontinued when present stock is depleted. 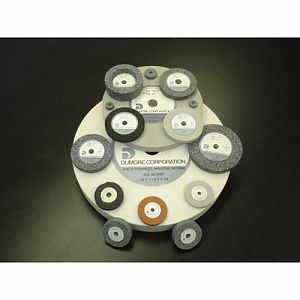 Please note: Dumore Grinding wheels can have a Delivery of 7-10 days. 1/2"dia x 1/4" x .125"
5/8"dia x 1/4" x .125"